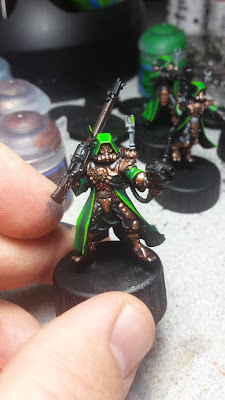 Brush Wizard: AdMech Skitarii - Finally Starting on the Army. 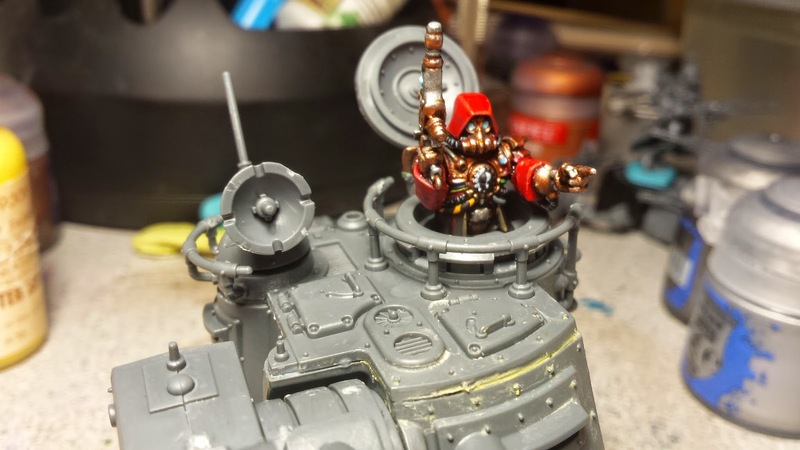 My favorite mini from the Skitarii has to be the Onager Dunecrawler, it is a really cool kit and to help decide on a color scheme I used my modified gunner, which I painted earlier. Originally I was going to go with red on the robes, since it's easier for me to blend and red is my favorite color. But the red didn't look that great with the copper/brass of the main body, and it all got lost together. I needed a new color for the robes, since I was sold on copper metals. 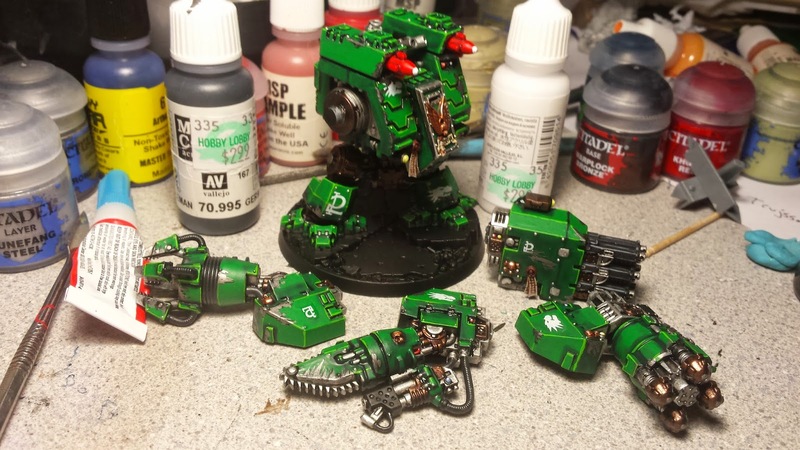 Then I painted the #WAAC Ironclad Dreadnought and the greens from it really grew on me. For that project, I used a triad of Caliban Green, Warpstone Glow and Moot Green. They gave a really nice contrast from dark to light, much more than I am usually used to. I liked it so much, that I decided to use them again on Araloth, when I did that project. This time I used wet blending to transition from one shade to the next as well. After this mini was done, I was sold on using these colors for my Skitarii. Now, while I was on vacation during Christmas time, I was able to start work on the army. I started with my squad of Skitarii Rangers, which is a 5 man squad equipped with sniper rifles. Each mini had their feet drilled and pinned, before attaching them to bottle caps for painting. Then they were all primed with GW Chaos Black spray. 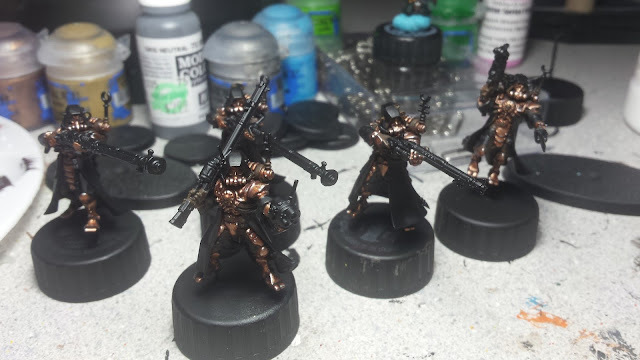 Base coat: Vallejo Chocolate Brown - This helps add more color to the following metallics, rather than having them over top black. It also acts as the first shadow layer. Layer: GW Brass Scorpion - Brass Scorpion is painted on all of the armor plating and cybernetics, leaving a line of Chocolate Brown visible in the recesses. Wash: GW Agrax Earthshade - The entire metal areas are washed fully with Agrax Earthshade to help deepen the shadows. Layer: GW Hashut Copper - Hashut Copper is layered on top of the dried wash, leaving a bit of the Brass Scorpion showing at the edges and near seams/ creases. 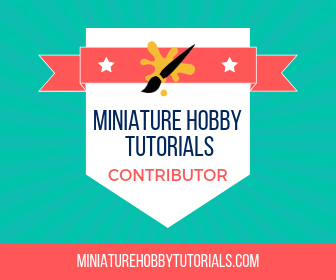 Highlight and Edge Highlight: GW Runelord Brass - In the highest points, Runelord Brass is used to show better reflectiveness of areas where light would be hitting the metal. It is also used to edge highlight all metal plating that would be logically brightened by sunlight. Shadow: GW Rhinox Hide - Reinforce the original shadow with Rhinox Hide, painting thin lines in the recessces, along areas that are hidden under clothing/ equipment. On the Rangers, I painted the entire area between their shoulders and backpack in Rhinox Hide, since shadows shouldn't be reflective. Doing this also helps separate reflective areas, helping your eye see details better. Spot Highlight: Runefang Steel - Dots of Runefang Steel are used on armor plating and edges to give the effect of the light source's strongest reflection. 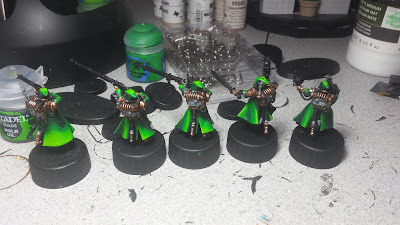 With the armor and metal areas painted, I moved on to the robes. 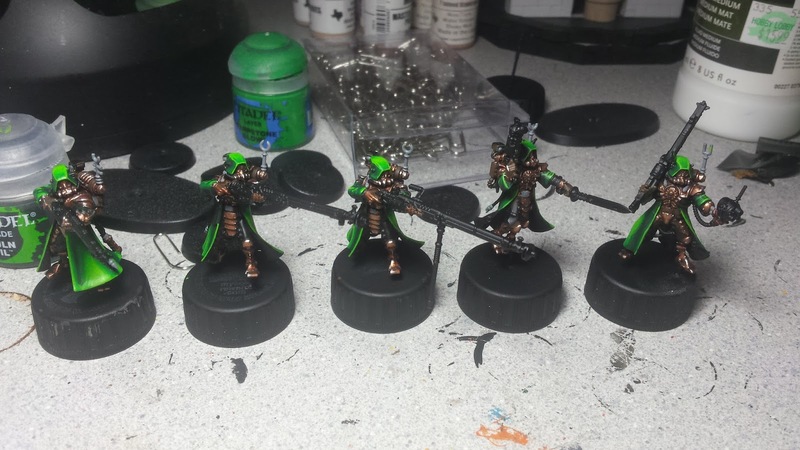 Painting them with the green triad of Caliban Green, Warpstone Glow and Moot Green. Each was painted with Caliban Green and a was of Nuln Oil, before having Warpstone Glow blocked onto it and then blending the edges with Caliban. had a few troubles on this step and it seemed like I was having a problem with my paint drying out on the mini too fast. I'm not sure what the issue was, especially since I was using a mix of water, matte medium and slo-dri. But for whatever reason it gave me fits. In the end the robes still turned out looking really good and I've gotten a bunch of complements on them. But I know I can do better and have smoother blends with more practice. Luckily I have 5 more Rangers and 10 Vanguard to paint yet. Practice will be had. fleshy people parts of the Skitarii from being damaged in the vacuum of space. There were rather simple to paint as well. Base Coat: Vallejo Black - Black was painted over the black primer to help even out the coverage and darken it more. Highlight: GW Dark Reaper - Any raised folds in the suit, or upper areas where light would be reflecting were painted with Dark Reaper. Edge Highlight: Vallejo Neutral Grey - spot and edge highlights of Neutral Grey were done on the top most points of the ridges to give the rubber a more reflective look. That's it for now. I've made some more progress other than this, But the post is getting kind of long. Check back later for more WIP posts on these guys, or you can see the progress unfold on Twitter @ryglore. Glad to hear your moving forward with them !! They are turning out awesome so far !! And that green looks so eye catching !! Awesome work ! Everyone loves the green, I'm really glad I went with it. I hope to get it done soon, then once it's all painted I'll start looking for games.